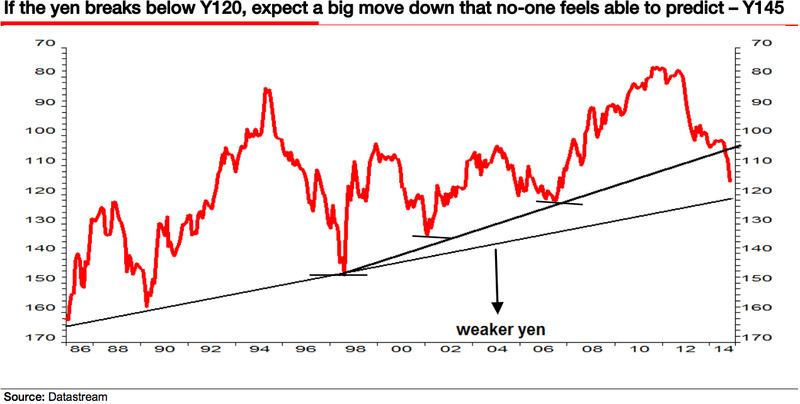 Societe Generale’s Albert Edwards says investors should be paying more attention to the yen/dollar chart. To the right, you’ll his chart, which goes back to 1986. Edwards writes that the “tidal wave of deflation” will first hit China, which has already seen a streak of falling producer prices. 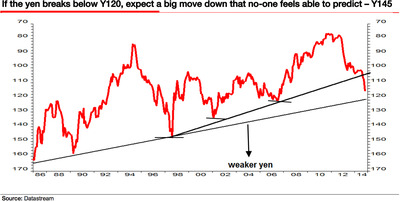 On Tuesday, the yen tumbled to a seven-year low against the dollar, trading near ¥115.7. It traded near this level on Thursday. The yen fell sharply late October after the Bank of Japan surprised financial markets by announcing an additional round of stimulus measures that will see its balance sheet expanding by 80 trillion yen a year. And a report earlier this week that Japanese prime minister Shinzō Abe is planning to call for a snap election pushed the currency to a seven-year low. The vote could shore up political support for Abe while also signaling to investors that dovish economic policy will continue.